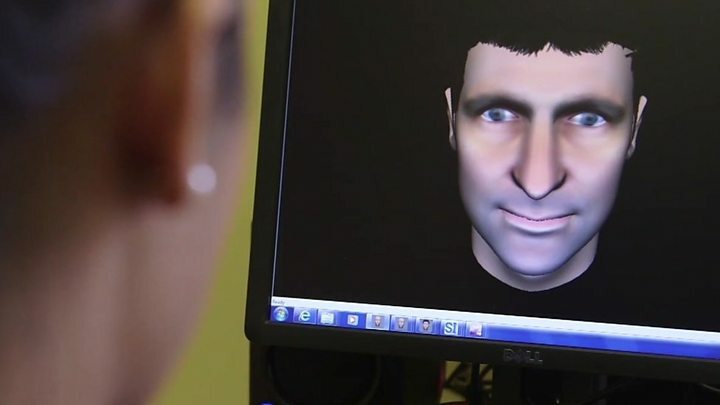 Confronting an avatar on a computer screen helped patients hearing voices to cope better with hallucinations, a UK trial has found. Patients who received this therapy became less distressed and heard voices less often compared with those who had counselling instead. Experts said the therapy could add an important new approach to treating schizophrenia hallucinations. The trial, on 150 people, is published in The Lancet Psychiatry journal. It follows a much smaller pilot study in 2013. Hallucinations are common in people with schizophrenia and can be threatening and insulting. One in four patients continues to experience voices despite being treated with drugs and cognitive behavioural therapy. In this study, run by King's College London and University College London, 75 patients who had continued to hear voices for more than a year, were given six sessions of avatar therapy while another 75 received the same amount of counselling. The therapist then voiced the avatar while also speaking as themselves in a three-way conversation to help the patient gain the upper hand. Prof Tom Craig, study author from King's College London, said getting patients to learn to stand up to the avatar was found to be safe, easy to deliver and twice as effective as counselling at reducing how often voices were heard. "After 12 weeks there was dramatic improvement compared to the other therapy," he said. "With a talking head, patients are learning to confront and get replies from it. "This shifts the idea that the voice is all-controlling," he said. Patients are encouraged to talk to the avatar and take control of the conversation, saying things such as, "I'm not going to listen to you any more." Seven patients who had had the avatar therapy and two from the counselling group said their hallucinations had completely disappeared after 12 weeks. By 24 weeks, however, the patients in both groups had shown the same levels of improvement, suggesting the avatar therapy required booster sessions in the long term, the study said. Prof Craig said the next step was to find out if the therapy worked in other locations before it could be made widely available on the NHS, but he said the findings were a "significant advance" in treating hallucinations. Prof Stephen Lawrie, head of psychiatry at the University of Edinburgh, said the trial was impressive and robust but more work was needed. "Further study is required to replicate these results, establish the role of such treatment versus others such as CBT [cognitive behavioural therapy], and clarify who might benefit most." Sir Robin Murray, professor of psychiatric research at King's College London's Institute of Psychiatry, said that if they could be reproduced, the findings "will add an important new approach to care". He added: "If a wholly psychological intervention such as avatar therapy can produce such an improvement, then it should make us rethink the way we conceptualise auditory hallucinations." Brian Dow, from charity Rethink Mental Illness, said he welcomed any attempts to try and develop new and innovative treatments for schizophrenia. "Hallucinations can be extremely traumatising for patients who experience them and the results of the this trial are promising." Prof Julian Leff, from University College London, is the inventor of avatar therapy.